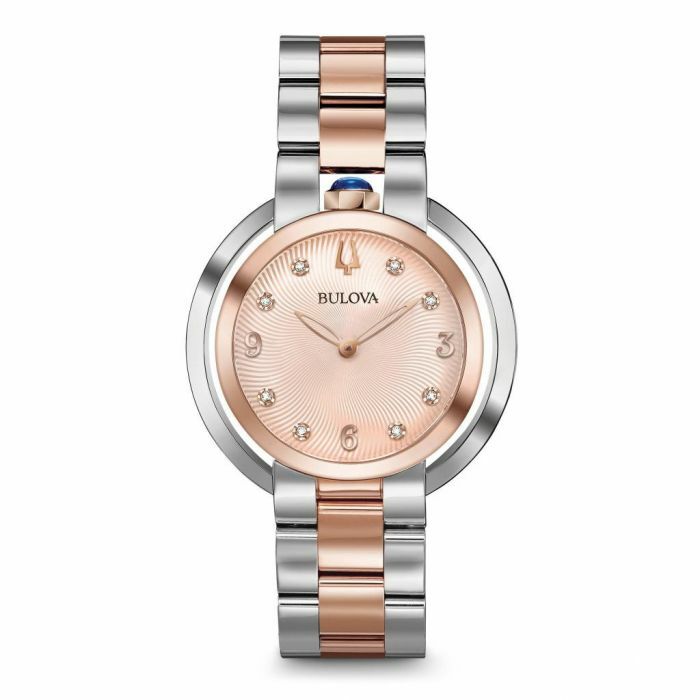 Rose gold-tone stainless steel bracelet and case, adorned by unique crown placement at the utmost point on the watch case. From the Rubaiyat Collection. Legendary heritage reinvented in rose gold-tone and stainless steel case with synthetic blue spinel cabochon crown at 12 o'clock position and eight diamonds individually hand set on textured rose-gold dial, curved sapphire crystal, two-tone rose gold and stainless steel bracelet with double-press deployant closure, iconic dye struck "Goddess of Time" dimensional case back and water resistance to 30 meters.